This is a platformer/board game based on Popeye, of course! 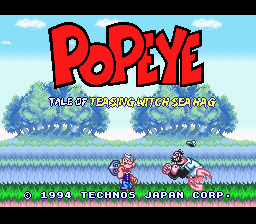 The witch Sea Hag has plotted to stop Popeye once again, this time by turning Popeye's friends to stone. His friends hearts' have floated away, attracting General Blozo. Blozo plots to have everybody steal the hearts for the military, paying them to do so. 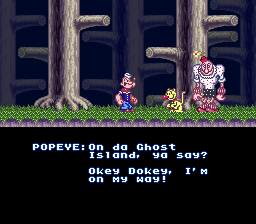 Can Popeye save his friends? This game was developed by Technos in Japan and America, but for some reason was never released outside Japan. That's too bad, as it is one of the better cartoon-based games. Character names for the passwords. Might be a bit of work, as it seems tiles are reused, contrary to previous thought. As you may notice, there were timing issues with the ending. I've made the delay between strings VERY short, so as to fit all the text in before it cuts to the credits. While it seems to work out, as most events are timed to the text, a couple events aren't, and I don't think I can easily fix them. Initially, the opening story will appear. You can watch, or press Start to go to the title screen. At the title screen, press Start, then choose Start to begin a new game, Pass Word to continue an earlier game. (Passwords are given after finishing a stage.) Then choose a 1 or 2 Player game. Choose Options to go to the Options menu. You can change the button settings, listen to a sound test, or choose stereo/mono sound. Select Button - Press on the map screen and you can scroll with the D-Pad. Press again to return. Start Button - Pause in a level. B Button - Jump during a stage or cancel on the map screen. X Button - Use a special anchor. Y Button - Attack with the anchor, or confirm choices on the map screen. Hold in a stage to run. L/R Button - Choose a special anchor. As a stage begins, you will be shown where all the hearts are on the map. Count them. That is how many you must collect before Bluto will appear on the map. 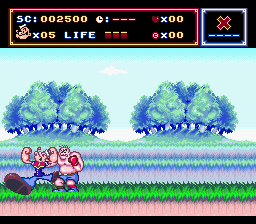 Fight Bluto to finish the stage. On the map, you can press Select if you would like to scroll the map. When you're ready to move, press the Y Button to roll the spinner. Press Y again to stop, or it will eventually stop itself. Then use the D-Pad to move. You can retrace steps to undo moves. If you bump into an enemy, you will fight them. They are also after hearts, so you will have to fight them to retrieve the hearts they've collected. Fly - Popeye grows a propeller. You can fly around the stage. Frog - Popeye can walk through narrow passages safely (Popeye can try to slide, by pressing Down while running. But if he doesn't make it through, he'll hit his head on the ceiling and lose a life.) Like Mario 3, you can also swim better as a frog. You can press Y to lick the enemies. However, frogs also have one-hit deaths. 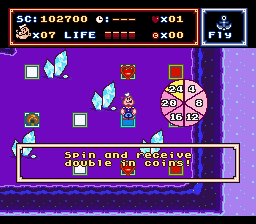 Wheel - Popeye can roll through the stages, attacking enemies who cross his path. Coins - Trade 100 for an extra life, or spend them on the map. Popeye Doll - An extra life. Turkey - Recover all health. White tile - usually nothing, maybe a Bluto encounter (you must avoid him on three passes). Blue tile - usually positive effects (free moves, health recovery). Red tile - usually negative effects (damage, forced movement across the board). Turkey - visit the Rough House. For 5 coins, you can have a free turkey. Anchor - You can buy random special anchors. Casino - Play the slots! Stages - If there's a heart on the map, be sure to find it in the stage!